Brett Dean's Ampitheatre ensures that Prom 18 will get big media coverage in Australia. Not a stupid idea, because media sales to other markets are a significant part of BBC finances. The more people watch, money goes towards funding other things. On the other hand, Dean's music raises questions,though not necessarily musical. Like how far is a composer respected for what he actually writes, as opposed to being a symbol of national identity, like a national airline? Symbolic composers are a good thing, and needed - Finland, for example, wouldn't be Finland without Sibelius. .But Australia isn't facing what Finland faced then. In 2007, Dean's Vexations and Devotions had international TV broadcast which probably cemented his status, but wasn't necessarily a musical experience. It was described as a "sociological cantata" which shared the same social conscience as Beethoven's Seventh Symphony. Dean's ideas, not the BBC's. The piece took itself far too seriously as the social issue here was automated telephone systems. Cute but trite. Maybe that's why it took such a long time to say so little. A paean to banality, rather than a critique thereof. I had promised myself not to listen to Dean's Ampitheatre but did. Unfortunately, it proved two adages. First, that marketing turns anything to gold. Second, that the biggest fish in a small pond isn't necessarily big. In 2007, they programmed Beethoven 7 with Brett Dean which said volumes about what Dean thiniks of himself. This time, the programme was less pointed, songs from Mahler's Des Knaben Wunderhorn, sung by Ekaterina Gubernova, and Shostakovich 10th, conducted by Mark Elder. Adequate performances, dutifully done. Better spend your time on Proms 16 and 17, both superb on their own musical terms. Not Hugues Cuénod, of whom there is a lot on this site, but Luo Pinchao (羅品超) (Law Bun Chiu), billed as the oldest opera singer in the world at his death, at 1.30 am on 15th July 2010. He was born 19 June 1912, by western reckoning aged 98, by Chinese reckoning 99. Apparently he was still singing until shortly before he died, although he officially retired aged 88. He was teaching until recently. At the age of 93, he performed one last time in an opera in Guangdong, commemorating his life work. He started training aged 11. The traditional style was rigorous, but the teachers were harsh because the craft of Cantonese opera requires great discipline and physical fitness. Life in touring opera troupes was tough, some singers used opium, but Law was young and didn't need it. In 2008, Hong Kong TV did a feature on him, and he demonstrated his moves. It's quite impressive as Cantonese opera is quite athletic and most people aged 96 can't wave their knees in the air. One is his trademarks was holding a pose, balanced on one leg while singing an aria. "It's kept me healthy", he said, about the physical demands of Chinese opera where movement is as expressive as singing. Law was tall, masculine and good looking, so he specialized in macho roles like virtuous generals and romantic heroes. Most of his career was live opera, but he made about 50 movies, mostly filmed opera. Film was "the" art form of Hong Kong, all singers did movies. Above is a clip from 1959, one of Law's great roles. Below one part of the long HKTV feature. 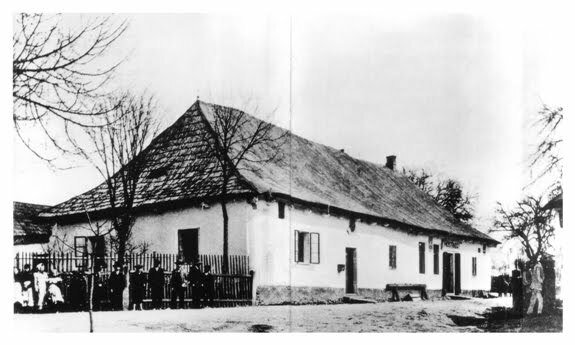 Mahler left Kalište when he was only six months old, so he didn't have any real connections with his birthplace. But 150 years later, Kalište hosted a big gala celebration. Thomas Hampson and Wolfram Reiger gave a song recital in a tiny performance room in the renovated farmhouse. As he quips to the audience "We're sitting where Mahler slept". Mahler in diapers, that's a thought. Bet he cried a lot. Weh! O Weh! The broadcast is now available on Medici TV. Hampson starts cautiously. He struggles with the high passages and visibly beams with relief when he traverses them, but don't worry, after the first few songs, he's fine. I think the July heat must have been oppressive, and it's a small room, lit by arc lights for TV. You can see Hampson sweat and drink a lot of water. Such things affect voice, so no discredit to him. He manages Das himmlische Leben Mahler 4/IV) fine, even though it was written for high soprano . Transposed down for piano song it works well as Lieder. He pairs it with Das irdische Leben, too, so the connection's clear. But this wasn't any ordinary recital because it was at Kalište. Look see who's in the audience! Hampson of course is inner-circle Mahler because he's contributed so much to Mahler scholarship and performance. Get his DVD Voices of Our Time - exceptionally good commentary by Hampson, who shows how Der Tambourg'sell and other war songs speak to a world that's seen the invasion of Iraq and the suppression of civil liberties. It's a classic introduction to Lieder as well as to Mahler song. For a hundred years after Mahler left, Kalište didn't mark him. Indeed, the original building burned down twice. About 15 years ago, a brass plaque was placed on the wall. However, sacred sites have commercial potential, and the place was renovated into a hotel resort. The Mahler moved out, now tourists can move in. As the publicity says "Now you can wake to birdsong, just like Maher did". 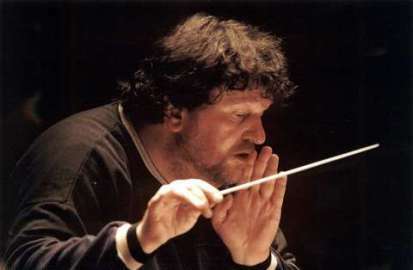 You can just bet that media reaction to Oliver Knussen's Prom 15 will be rabid. Why did he programme pieces that take 3 minutes to play and need 20 minutes to set up? But that's Ollie all over, having fun and confounding expectations. Quite possibly the same Pretty Plastic Pundits who think random applauding is clever will howl when Ollie gives them exactly the kind of concert where "rules" for clapping don't apply. Much horror too, because Knussen programmed Stockhausen with Schumann. Again, this is no big deal - Simon Holt's a table of noises was the surprise hit of Prom 13, where it unexpectedly won over an audience who'd come for Schumann and Strauss. Mixed programming is nothing new, unless you've spent the last 100 years under a rock. Henry Wood did it too. So what's Ollie's point? Confounding assumptions = shaking up preconceptions. First, no-one died because they had to hear Stockhausen's Jubilee. It's joyous, celebratory, fill of "starburst" cadences, twinkling tracery and trumpets heard off stage like angels in the heavens. Dramatic and even benevolent, not "difficult" at all. Jubilee is Stockhausen's tribute to the folk music of his native homeland, the star Sirius. Then Harrison Birtwistle's Sonance Severance 2000 (1999), only three minutes long, but requires massed celli, basses and brass. Again, that's the point. Massed brass herald the first theme,winds and strings develop it and suddenly it snaps shut with a humorous bleat from single trumpet. A symphony compressed to its essence which lies hanging, hinting that more is yet to come. It was written for the reopening of Severance Hall in Cleveland, so the idea is perfectly cogent. Sonance Severance connected Stockhausen's Jubilee with Colin Matthews's Violin Concerto (2009). I wasn't knocked sideways, though my companion was impressed, but so what? First reactions are first reactions. On rebroadcast I've grown to appreciate why I liked Leila Josefowicz's high, flowing legato so much. It's elusive, floating dream like, sognando, about the constant flux in the orchestra. My partner was much taken by the alternations in the sections of the second movement. Then, the culmination of the first part of this programme, with its sparkling stars, fairy violins and magic trumpets. Luke Bedford's Outblaze the Sky (2006). Another tiny, six minute work that packs a punch many larger pieces cannot equal. Exquisite passages, shimmering on densely resonant background. Immediately I thought of Britten's Sea Interludes, though it's certainly not like them, and they weren't on Bedford's mind when he wrote the piece. He was thinking in terms of poetic dream. He says "I imagined the piece to have a warmth and certain haziness, ....virtually every pitch is scored with glissandos, harmonics, flutter-tonguing, tremolandos and molto vibrato". At first, it seemed odd to switch from this luminous mode to music about the mighty Rhine. Bernd Alois Zimmermann Rheinische Kirmestänze (1950) was paired with Robert Schumann's Symphony no 3 also known as the Rhenish, because it was inspired by the Rhine. "Only connect" Knussen seems to say. Knussen's programmes are often like intricate puzzles, with myriad cross-references that illuminate the works in new ways. Both Zimmermann and Schumann loved the Rhine. Rivers are a powerful metaphor for creativity. In the case of the Rhine, it springs from the Alps, right through the heart of Germany. After the demonic Prom 4, no-one attentive shouldn't recognize what the Alps mean in terms of the Romantic imagination. (another intelligent undercurrent in this year's BBC Proms). For Schumann, and for Zimmermann, the Rhine isn't simply a tourist trip, decorated by Rhinemaidens. Both Zimmermann and Schumann were deeply intellectual, both prone to depression. Schumann tried to commit suicide by junping into the Rhine, Zimmermann, who grew up on its banks, was more successful. Then Knussen springs another surprise! So far in this Proms season,. all the Schumann so far (except for Manfred with Petrenko, Prom 4) has been indifferently performed at best, especially disappointing in this Schumann year. Then, Knussen, with his reputation made in new music, goes and conducts the finest Schumann performance of all! This worked for me because it accessed the wilder aspects of late Schumann, which I don't think we've really begun to appreciate. Wonderfully alert, energetic playing from the BBC Symphony Orchestra, the top BBC orchestra by far. This was a joy to hear - listen to the repeat broadcast online, it beats many better known versions. Again, it's inspired by Knussen's feel for musical puzzles. Listen to the final part of the last movement, the Lebhaft (derived from Leben). A similar apotheosis to the final upthrust in Bedford's Outblaze the Sky and Birtwistle's Sonance Severance! "New" and "old" are silly labels. The sooner people listen "as music", the more they'll get from it. If only Schumann, who adored cryptic musical puzzles, could have heard Knussen's Prom. When it comes to Beethoven's Fifth, I turn to jelly. It's so wonderful that even school bands sound good. So when an outstanding performance comes up, I melt in ecstasy. 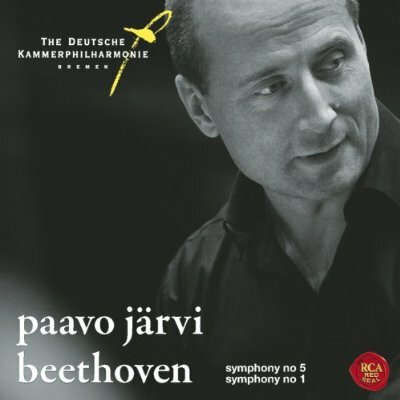 Paavo Järvi brought the Deutsche Kammerphilharmonie Bremen to BBC Prom 14. Another historic occasion, for Järvi's Beethoven cycle breaks new ground. This orchestra ia superb, reflecting the modern European trend towards specialist virtuoso ensembles. Traditional city-based orchestras can fossilize, but orchestras as "elite units" keep fresh. What a vivid sound the DKB give Järvi! Such sharpness of attack, such energy, such brightness. Gone the accretions of performance tradition which may or may not reflect Beethoven. Instead, the music feels like it's flying straight off the manuscript, clean and vigorous. It "lives". You half expect the composer to turn up and take a bow. The period instrument ethos definitely helps. Natural horns may not be as sophisticated as late 19th century improvements, but they're brighter, more human in many ways. Textures are lighter, but they move. When Beethoven could still hear, that's what he might have heard. Authentic in itself means nothing, though. Järvi and his orchestra make their Beethoven 5 sound right because they access the spirit of the symphony. This is Beethoven in full flow, glorying in the joy of creation.. What freedom, what clarity! 200 years after it was written, it's still AUDACIOUS. After hearing the Fifth, listening again to Järvi and the orchestra do Beethoven 1 enhances the experience. It connects to the 5th, so brave, so assertive. And then, Hilary Hahn plays the Violin Concerto in D major. She's on the DKB vibe, too, wonderful. And as a bonus, an encore! The Allegretto Scherzando from Beethoven 8. But listen to the broadcast online, on demand and all over the world until next week. Highly recommended.Get the recording,too, though it's not quite the same. Best Prom so far in an illustrious season. Of course, my weakness is period-sensitive orchestras and their agile sound. My next best was Petrenko Schumann, Rachmaninov and Tchaikovsky, Prom 4. So far this season only 3 duds of sixteen (two I haven't written about and one stinker coming up I won't listen to). PS I have been wonderstruck by Paul Lewis's Beethoven, especially Piano Concerto no 2 on 29th (Prom 16) and 4 on 21st (Prom 6). I don't usually write unless I have something original to say, and it's pretty obvious, everyone swoons for Paul Lewis. And Andris Nelsons, who is brilliant. Gweneth Ann Jeffers and Mark Stone star in Verdi La forza del destino at Opera Holland Park. Word has got round that this will be an above average performance, so the few seats left last week have disappeared. Regular readers on this site will know how highly I rate young singers. I've been following Gweneth Ann Jeffers and Mark Stone. Good luck to them both! They've both got potential and deserve support. Please read here about Jeffers singing Messiaen Harawi and Poemes pour mi. Singing Messiaen is a brave speciality. Messiaen's style is unique. A voice with great range and expressive colour is needed, but above all an intuitive feel for the wayward alien quality of Messiaen's music. Jeffers has genuine musical intelligence, which is very special. In comparison, other things are almost "easy". She has a vivid personality, too, and a solid background in musicianship to build on. Lots of experience, too. Read more about her HERE. Prom 13 gives Simon Holt's a table of noises (lower case) the high profile coverage it deserves. Highly acclaimed at its 2008 premiere, a table of noises is an anti-percuussion concerto, almost a "miniature" compared with pieces like James Macmillan's Veni, veni Emmanuel, another Colin Currie speciality. For a review of Simon Holt's latest work, Centauromachy, a commission by BBC NOW please see HERE. The "table" refers to the table at which his disabled great uncle worked, all tools readily to hand, meticulously organized. It's a metaphor for the music. It's strictly defined but the very confinement generates inventiveness. Holt uses simple means for maximum effect. Colin Currie plays a variety of small instruments, played in groups of three. Around him, a brass and woodwind orchestra making equally down to earth sound - is there a tin whistle in the mix? or a squeak toy? Doesn't really matter, the overall impact is down to earth, and jaunty. 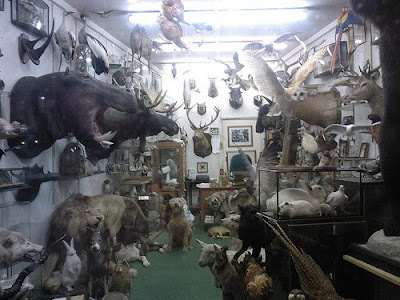 Holt's great uncle Ash was a taxidermist who stuffed birds and small countryside animals. There's something surreal about taxidermy. It brings the woodland to the parlour. You can't be decorous with a dead badger in the living room, staring at you thru glass eyes, lifelike but immobile. Like Simon Holt, I too knew a taxidermist (game birds only). It's fiddly, messy work and quite unnatural, but strangely fascinating. I loved a table of noises. It feels to me like a kind of grave but vivacious dance, maybe a ritual, maybe a celebration in some place or time very different from now. Clog dancing, even, and I thought of third world musicians who do wonders with simple materials like sticks and barrels. That's a compliment to Holt, because it shows his innate feel for what makes good music. Those sharp, clattering noises carefully spaced out with silences, those odd rhythmic progressions. Hammers and chisels in a workshop, clattering away. It is so much fun! Currently there's a fashion for saying new music and emotion can't go together. That's irrational. as all music has emotion. Emotion just means different things to different people. a table of noises proves that meticulously well constructed, innovative music can be vigorously free and passionate. How much fun it was to hear a table of noises together with Richard Strauss Till Eulenspeigel. Both irrepressible, idiosyncrasic creatures that do their own thing, regardless of what the world might think. Performance wise, the best part of this Prom was definitely the latter. BBC NOW under Thierry Fischer aren't the most dynamic of BBC orchestras, so it was probably too much of a stretch expect them to pull off a concert that ranged from Cherubini to Holt. Holt is their composer-in-residence, which is good though as that expands them. Hopefully when a table of noises is recorded, it will be with a specialist contemporary orchestra. Then we'll really gasp ! This is a work that will last. Listen to the broadcast HERE until next Monday. Very loosely based on the fairy tale of the Pied Piper of Hamelin, George Benjamin's Into the Little Hill, now at the Linbury Studio at the Royal Opera House, depicts a conformist community that rats on the piper who rids them of vermin. So he takes their children into a "liitle hill". The one act opera is disturbing because it treats the story as nightmare. Into the Little Hill operates on many different levels at once. There's a politcial element. The mob violently demand the extermination of all rats, and the Minister sells his principles for votes. There's a suggestion that the rats aren't rats but other humans. As the Child says, they wear clothes and carry suitcases - an echo of the Holocaust? There's social commentary, and the spectre of child abduction, all the more disturbing as the father is implicated. Nightmares are powerful because they reveal themselves through portents, subliminally working on the subconcious. This is a work that defies classification. Quite likely Benjamin and his librettist Martin Crimp can't explain its full portent, because it operates on the unconscious, on a subliminal level which cold logic cannot reach. That's why it's endlessly intriguing. Perhaps the way to get into Into the Little Hill is to let your intuition lead you. The Minister's Child appears to her mother in a chink of light. "Come home" says the mother. No, says the child, "Our home is under the earth. With the angel under the earth." What can that mean, no-one knows. But as the child says "The deeper we burrow, the brighter his music burns". "Can't you see?" cries the child. The child sees, because it doesn't carry the millstone of received wisdom. Into the Little Hill operates like a half-remembered dream, flotsam flowing out of the unconscious, to be processed in the listener's mind. 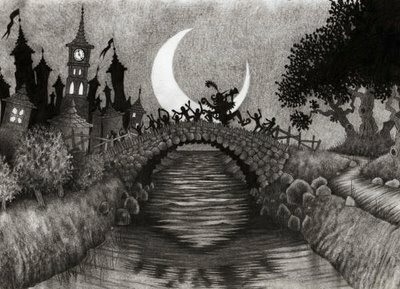 Rats invade the town, eating grain and concrete, destroying the foundations of social order, Later, the children disappear into the bowels of the earth. "We're burrowing" sings the child, "streams of hot metal, ribbons of magnesium, particles of light". A "man with no eyes, no nose, no ears" materializes in the Minister's little daughter's bedroom. He invades the sanctuary, mysteriously, disturbingly. He is powerful because he can breach all defences, even the Minister's office. "With music I can reach right in /march slaves to the factory/ or patiently unravel the clouds" Sinister as he is, he's morally neutral - "The choice is yours" he says to the Minister. The whole opera pivots on ideas of dissimulation, concealment, crawling into dark recesses. Nothing is safe. So the music here is cloaked in disguise. You hear something eerie, or harps or bells. Sure enough, there's a cimbalom right in the heart of the orchestra. You hear something tense, tinny and shrill: it's a banjo, and conventional strings being played like banjos, strings plucked high up the shaft, not bowed. Much emphasis on low-toned instruments like bass flute and bass clarinet, whose sensuous, seductive themes weave through the piece like a narcotic night-blooming flower. Susan Bickley and Claire Booth sing. The parts aren't defined, as such. Their voices interchange, with each other and with the "voices" in the orchestra, adding to the unsettling, dream like effect. Bickley and Booth are the foremost interpreters on modern music in this country. They are superb. Good as the recording on Nimbus is, the singers there don't come close to Bickley and Booth, who have lived with the piece regularly for some time. Their expertise matters, because this singing has to be approached with an almost intuitive understanding of how the vocal parts interact with the music. Both are attuned to the inner logic of the piece, so the ever-changing balance flows seamlessly. Although the text is conversational, the syntax is surreal. At several points, Booth has to "sing" at such a high pitch she's almost inaudible. It takes physical effort. She braces herself, so as not to strain her voice beyond the limits. Humans might not hear such pitches, but rats can. The staging, by The Opera Group (director, John Fulljames), fits the music and the semi-narrative. The Man with no Face operates through music: the London Sinfonietta play on stage, behind a gauze curtain, vaguely visible behind the action, very much part of the concept as the orchestra is so important in this opera. The stage is dominated by a huge circular frame. "I can make rats drop from the rim of the world" says the man with no eyes. "But the world, says the minister, is round". "The world – says the man – is the shape my music makes it." The floor is scattered with black, soft objects. When I attended the performance at Aldeburgh in June, I was close enough to touch and smell the acrid stench of rubber. It's a striking extra dimension. By the time the production reached London the smell was almost gone. It was less oppressive, but gone too was the extra element of menace..Like music, smell can't be seen but it operates on the mind. Into the Little Hill was preceded by Luciano Berio's Recital 1, It's a tour de force, testing a singer's full range. It's a stream of consciousness monologue. Susan Bickley was magnificent., singing for nearly 45 minutes. Snatches of Lieder and Opera rise to the surface, receding as her mind moves on to other things. It's tragic, for the singer is desolate, looking back on a lifetime of loneliness. Since Berio wrote it for Cathy Berberian long after their marriage ended, it's bitterweet, but also strangely affectionate.The interplay between singer and orchestra reflects the interplay between composer and muse. Many in-jokes, such as when Bickley sings "A composer is socially embarrassing when he tries to speak". But that's the whole point, for Berio speaks through the orchestration, The piece is an elaborate puzzle-game, tightly scored with intricate key changes and modulations. Berio plays with illusion. 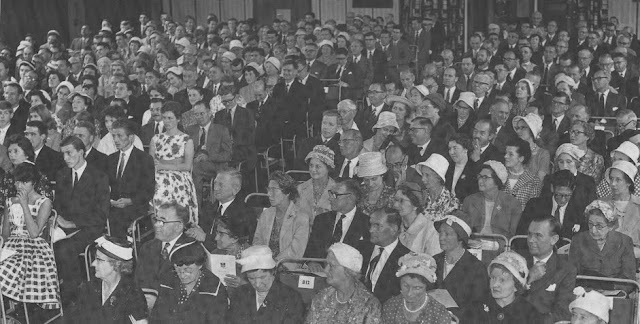 At one stage, members of the orchestra emerge to share space with Bickley. They start to play, but the sounds are grotesquely distorted. Then they exchange instruments. What do these musicians normally play? This was the London Sinfonietta, Britain's best contemporary music orchestra, an ensemble of virtuosi. Berio is having a laugh, for the rest of the piece is so sophisticated that bad players would be completely lost. Bickley leans towards the audience, trying to get them to respond to her directly. I very nearly did. Berio and Berberfian would have been thrilled, for part of the concept behind this piece is the relationship between illusion and reality. "Isn't all life theatre? 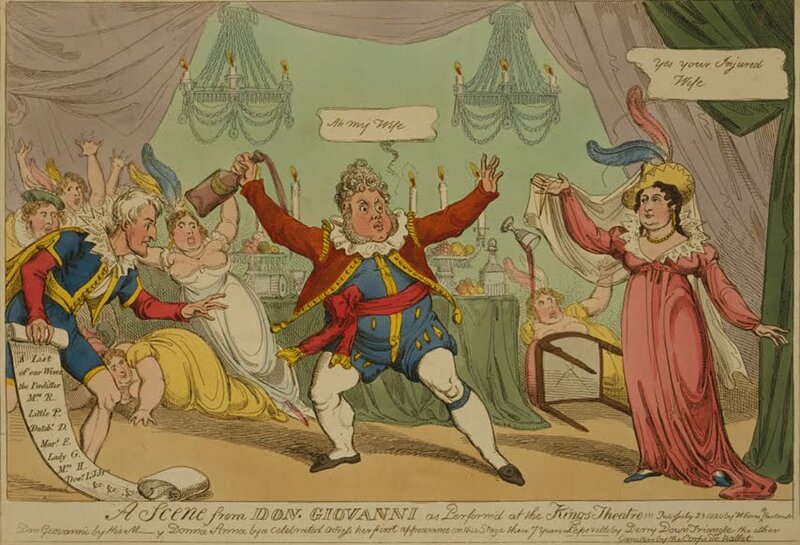 ", declaims Bickley, with a diva-like sweep of her arms. At the Proms, some people clap between movements. Oddly that's a sign of success, proof that the Proms are reaching people who might not normally attend classical music concerts. Most people are used to pop, where almost nothing lasts more than 3 minutes, so the idea of a long recitative is alien. At any pause, they clap. I'm not going to shush or complain. Better that people should come, listen and experience. If they make a "mistake" it's not the end of the earth. The real mistake is assuming that applause means any one thing. There's a lot more to applause than appreciation. Sometimes it's sheer bewilderment. People need something to do when they're bored, which is why they smoke or check their phones constantly (as if the world will collapse because you've missed a call). So they clap when there's a gap. But applause interrupts the flow of a performance. The more interruptions, the more disjointed the performance. So more applause to combat ennui. A vicious cycle. Because classical music carries connotations of class, it's a status symbol. If you can afford fancy seats, ergo, you're "cultured". Music becomes a consumer item you "own" because you've paid for it. Some applause (and booing) has more to do with the patron having something to prove to the world. For some people, they themselves are the only show in town, so they think the world cares whether they show approval or not. It doesn't. "Let us remember that we exist for the music, not the other way round"
Reverse snobs are even worse. It's one thing for people to clap spontaneously, and innocently. But to actually advocate random clapping? That's boorish. It encourages people "not" to listen. It encourages instant conclusions instead of mature reflection. And it's intrusive and disrespectful to others. Reverse snobs set out to destroy. What is so wrong about music that it has to be brought down ? Why is wrong to simply listen and enjoy ? Why introduce TV Game Show values ? Although music is heard in public, each person is listening in a private way, processing what they hear into their souls. Perhaps it's the Eternal Troll thing, "what I can't do, no-one else should". Beware Pretty Plastic Pundits. Since they don't care about music or listen, they need to push the random applause idea in order to have something to say. Filling space, without substance. But performance exists on its own terms. Performers have put thought into what they do, and they deserve respect, whether or not Seat 22 Row H likes it or not. Performers enjoy applause - everyone does - but when applause happens willy-nilly it's not appreciation but mechanical reaction. Better sincere clapping than ritual clapping and worst of all show-off clapping for its own sake. Unthinking applause isn't a sin. It's wonderful when people respond to things sincerely. But inappropriate clapping is not a good idea. Bad habits turn into false "traditions" and become harder to eradicate. It's pointless to suggest rules because these get in the way, adding unnecessary extra stress. The real purpose of performance is to listen. Sounds simple, doesn't it? But lots goes on in the mind while you're listening. So maybe the only "rule" is to listen, to engage fully with the performance even if it's a new experience. Respect for the music, and respect for others in the audience, who might be trying to listen without distraction. Applause becomes irrelevant when you're really listening. So think before clapping and listen instead. It's not that difficult. Incidentally it's a fallacy that applause was acceptable in the past. Western music springs from two main cources : religious music and popular entertainment. Did people applaud and carry on with Schutz or Bach ? Of course not. The man who became the legend of the Flying Dutchman came from the coastal village of Terneuzen, on the southern bank of the Westerschelde. Now there's a 6.6km tunnel there, the longest in the Netherlands, The things you learn from cycling magazines (thank you Cycling Weekly). Cyclists aren't neanderthal, unlike some other sports fans. Comes from being European-minded, I guess. Coming up this week: Schumann, Oliver Knussen, Luke Bedford, Simon Holt and more on Hubert Parry too. Doci Papiaçám di Macau, "The sweet dialect of Macau".This is a famous Portuguese song, but the language isn't Portuguese, but Macanese Patuá (patois). By the time Macau was officially established in 1557, Portuguese seamen had been trading with Asia for over 50 years. Three generations already, since from the start the "Portuguese" abroad became mixed race, multilingual hybrids. Portuguese can't recognize Patuá because it retains medieval expressions, quite alien to modern use, but following Malay and Chinese grammar, spiced with words from India and Japan. A goldmine for archaeologists of language. Such specialisms exist: Graciete Batalha researched the dialect extensively in the 1970's. Patuá has been dying out since the 1950's when most Macanese emigrated abroad. But there've been many efforts to preserve it because it's so unusual. It's naturally melodic: like Chinese it's a tonal language, where tenses are expressed by slightly different tones. Words are doubled up for emphasis, and rhythms adapted for elaboration. Europeans used to disparage its "sing song" nature, but for me that's a strength. Someone really should set Macanese verse to music that capitalizes on its exotic nature. There are lots of poems, stories and plays in Macanese to choose from. Also tapes of native speakers, so you can hear the way the language moves. The song above is a light hearted lark by Henrique Senna Fernandes, the best known poet in the dialect. Sorry, I can't translate! But the text refers to Macau culture and specialities. FOOD! Enjoy the video, too, with local scenes. Lots more on Macau on this site, please explore. I might also do a recipe for some of the foods mentioned - already posts on balichoa and minchee, the ultimate Macau soulfoods. George Benjamin's Into the Little Hill is back at the Linbury Studio Theare at the Royal Opera House. It is a work that defies classification. Quite likely Benjamin and his librettist Martin Crimp can't explain its full portent, because it operates on the unconscious, on a subliminal level which cold logic cannot reach. That's why it's endlessly intriguing. Perhaps the way to get into Into the Little Hill is to let your intuition lead you. The Minister's Child appears to her mother in a chink of light. "Come home" says the mother. No, says the child, "Our home is under the earth. With the angel under the earth" What can that mean, no-one knows. But as the child says "The deeper we burrow, the brighter his music burns" "Can't you see?" cries the child. The child sees, because it doesn't carry the millstone of received wisdom. So far I've seen Into the Little Hill three times, each time more rewarding. It marks a change in Benjamin's style. Formerly he obsessed about refining details to pointillist perfection. Now he's eschewed micromanagement for something much more organic - instinct. Into the Little Hill seems to spring from deep within his psyche. Yet the details are there, too, more integrated into the flow. This time, sitting up close, I picked up things I'd missed before, like sounds so high pitched human ears almost can't hear, but rats can. Claire Booth sometimes "sings" without using her physical voice. And grasps her tummy protectively so the effort of using her lungs and muscles so strenuously doesn't strain someone who can probably hear already, within her womb. As usual, this is just a taster because I'll write a more formal, extended piece in Opera Today. In the meantime, read about the Aldeburgh performance in June. Guess who's coming to dinner ? Be careful who you invite. They might just turn up! Don Giovanni from Glyndebourne on Medici TV tonight Or was, at the time I posted this - suddenly there's a new notice "not available for viewing from UK" perhaps this is because the BBC is showing it at Xmas. But Medici says the film will be available "on demand" at some stage. Please let me know what it's like especially those who've seen it live. Filmed versions of opera are always different from the real thing because what you're seeing is the view of the auteur, in this case Peter Maniura. A good film director enhances the experience, a bad one kills it. Film and live aren't necessarily the same. But listen to that amazing playing from the Orchestra of The Age of Enlightenment. Please see what I wrote about the performance at Glyndebourne..
A new production of The Prince of Homburg by Heinrich von Kleist opened yesterday at The Donmar in London. The Prince of Homburg is a psychodrama, but completed in 1810, long before the language of dreams had a vocabulary. It deals with moral issues like honour, duty, betrayal and the very idea of goodness in a mad world. It's 1675, and North Germany has been invaded by Sweden. 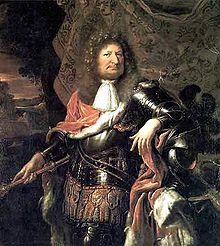 On the battlefield at Fehrbellin, it seems at first that the Grand Elector of Brandenburg has been killed, riding heroically into the heart of the battle. Inspired by this image, the young Prince of Homburg seizes the initiative which decisively changes near defeat into decisive victory. As in battle, in life, sudden cataclysmic changes. Because he disobeyed orders to stay put, the Prince is court-martialled and sentenced to death. The play is about how he deals with the crazy situation he's in. 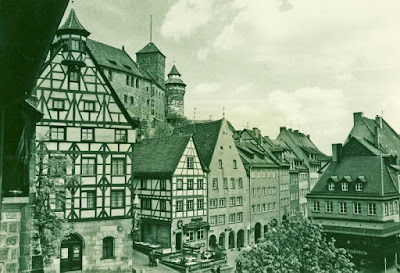 The Prince of Homburg is a fascinating story which operates on many different levels. It's been produced many times, in many countries, and is the subject of several movies. I vaguely remember an earlyish German black and white movie, but not much else about it. The best and most readily available film is Marco Bellochio's ll principe di Homburg. (1997) Although it's in Italian, it's very atmospheric, tautly directed and acted, so it feels like you're trapped in the Brandenburg marches, in savage wartime conditions. War is irrational, which is why the Elector is so harsh on the young prince. Hans Werner Henze's opera Der Prinz von Homburg (1960) has been performed many times, though there is only one full recording, the DVD of the .Bayerische Staatsoper production of 1994. 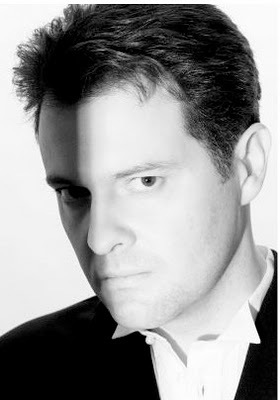 Wolfgang Sawallisch conducts, and the French baritone Francois Le Roux sings the Prince. Musically it's OK, though one could imagine something more intense and gritty. Henze cloaks his dramas in beguiling elegance, but at heart they're startlingly sharp. Nikolas Lenhoff directs, with designs by Gottfried Pilz. Achingly brightly lit, which is perhaps not a bad idea, given that the Prince is "under interrogation" but there's more to than Andy Warhol outlines. I prefer the shadows of the Bellochio film, where you can feel the poison seeping, ,like miasma rising from the marsh. 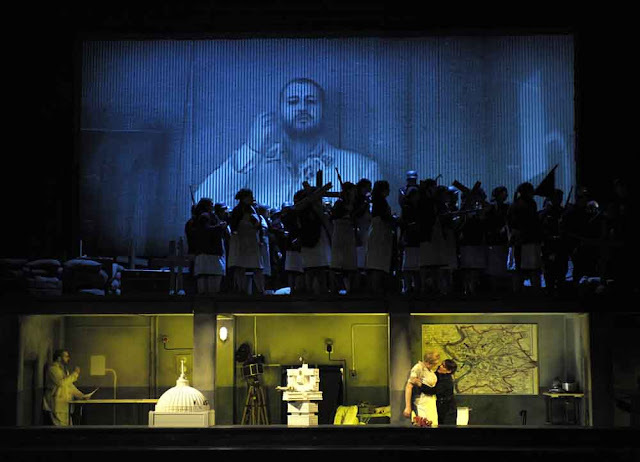 In 2009, there was another major new production of Henze's Der Prinz von Homburg, at the Theatre an der Wien in Vienna, which specializes in intelligent and musically-informed. Marc Albrecht conducted the Vienna Symphony Orchestra, and singers included Christian Gerhaher as the Prince, Britta Stallmeister as Nathalie, to whom Henze and Ingeborg Bachmann, his librettist, gave a much bigger part than von Kleist did. Hard to judge by photos alone, but it looks as good as the cast. Larry Lash in Opera News says "Christof Loy conjures a dream world, a telescoping wooden box that goes from charcoal gray to infinite pitch-black designed by Dirk Becker. The opera begins in white period costumes by Herbert Murauer, with the singers' faces powdered, but it gradually moves to late 1950s street clothes. Bernd Purkrabek's lighting is miraculous: by framing the proscenium with strips of bright white light, he makes it possible to change the entire stage picture in a matter of seconds. Loy takes a pessimistic view of the denouement: the Prince chases everyone offstage and, as in one of his premonitions, plummets into his grave in a startling coup de théâtre." Another description, in German Der Blick ins Grab der Erkenntnis (a Glimpse into the Grave of Knowing by Roberto Becker. More photos by Wilfried Hösl on this link - I've borrowed one under "fair use" conditions. And the Donmar production, using an English adaptation? Strictly speaking I cannot say, because I was in a seat without any legroom and was forced to leave in the interval. Don't Health and Safety Regulations apply? I can't have been the first to suffer and won't be the last. The Donmar really should take this more seriously. Nonetheless, it was a decent production even if it didn't reach the many deeper levels in the drama. Updating to Jane Austen times prettified what isn't a pretty drama. Uniforms don't necessarily depict war : the war in the Prince's mind goes deeper. Maybe it's just as well I didn't stay. They changed the ending ! Guardian theatre critics at least, seem on the ball, read Michael Billington. He realizes that Kleist wasn't writing TV costume drama. Interesting biographical note on Heinrich von Kleist (from Joachim Maass, trans 1983) Kleist was a blackish sheep from a noble clan, one of whom was Fieldmarshal Ewald von Kleist (1881-1954) who must have known similar dilemmas of duty given who his Leader of Staff was. The von Kleists weren't too happy about Heinrich's death site on the Wannsee becoming a tourist spot. Anthony Rolfe Johnson "such the tenor man told"
Anthony Rolfe Johnson, the quintessential "English tenor", has passed away after a long struggle with Alzheimer's, which ended his career far too early. He was only 69. Here he is, singing Benjamin Britten's The Choirmaster's Burial from Winter Words (Thomas Hardy). "Such the tenor man told, when he had grown old"
An old choirmaster dies, and a young tenor chorister assumes they'll be able to sing him on his way, but the vicar says no, it's too cold, get it over as quickly as possible, bury him without ceremony.. When he had grown old." Four days in a row of thrilling Proms, so I guess we can't complain if the pace somewhat flagged for Prom 5, Semyon Bychkov conducting WDR Symphony Orchestra from Cologne. In comparison to Elijah Moshinsky's directoral style, any musical performance would sound animated. I didn't make it to last year's Lohengrin, which Bychkov conducted, but on the basis of this Prom Prelude, maybe it was just as well. WDR Symphony can be very good, but they're a radio orchestra, rather than an opera orchestra, so perhaps that's a difference. It was pleasant in a tulle and white satin way. Perhaps it's the swan boat rising through light. But in this performance it was better not to think of the pagan death drama to follow. More disappointing was the Mendelssohn Violin Concerto, Vivian Hagner as soloist. It's one of the most lyrical pieces in the whole repertoire, but you wouldn't know if this was the first time you'd heard it. It really needs exceptional rather than competent performance, especially in something as high profile as the Proms. Semyon Bychkov says he loves Gunther Schuller's Where the World Ends. So one wonders how much worse this piece might sound with a conductor who doesn't. Schuller wrote the piece in only a few weeks, which in itself is no big deal, because sometimes composers are inspired and turn out pieces that have a life of their own. Here though, it's as if the music's churned out to order, hitting the buttons without starting the mechanism. A bit of jazz, a bit of Stravinsky, big and busy, self consciously clever. Sound and fury signifies nothing, as Shakespeare said, even though they strut and fret. Bychkov redeemed himself somewhat with Richard Strauss's Eine Alpensinfonie. 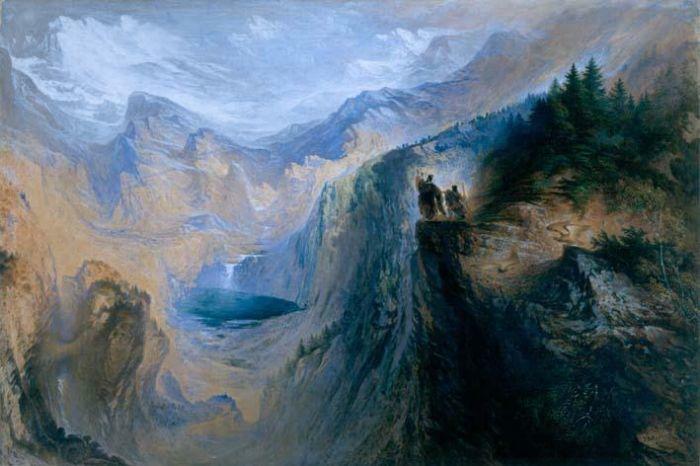 After hearing Tchaikovsky's Manfred (Prom 4 Petrenko, RLPO), you're attuned to a more demonic, metaphysical image of the Alps, which Strauss certainly understood. Again, this was an attractive performance, perfectly pleasant, but civilized. As Edward Seckerson says "It was a little like experiencing the DVD rather than the big screen theatre presentation." Listen to Petrenko again HERE which continues to impress the more you hear it. Definitely an equal to the Big Three blockbusters that started this year's season. All of the Beethoven Prom 6 was much more fun. The Spanish beat the Dutch in 1568, which inspired Goethe, Beethoven and the independence of the Netherlands. Puts football into perspective. I enjoyed all the performances. Paul Lewis, Bělohlávek and the BBCSO have such good rapport. Manfred x 2 at Prom 4: excellent idea, programming Schumann's Manfred Overture with Tchaikovsky's Manfred Symphony, one amplifying the other. Amplification is the right word because the hero /anti hero Manfred swings between extremes, sees visions of the supernatural, hears voices from nowhere, and has religious delusions. Manfred is the ultimate Romantic hero/anti-hero, regardless of whether Lord Byron created him in his own image. Romanticism was a revolt against the Age of Reason. Instead of classical elegance, extreme distortions, and obsession with the macabre. Nowadays we'd pin psychiatric labels on many Romantic heroes, but in the early 19th century they represented a revolutionary breaking away from earlier ways of thinking. Instead of Absolute Monarchs, the idea of the Individual making his own rules. Romanticism unleashed the subconscious and electrified European literature, art, philosophy and music. Robert Schumann doesn't get the respect he's due because the impact of Romanticism isn't fully appreciated. Because he ended up "mad", his later work has been minimized. Yet in many ways, late Schumann is interesting because he's breaking away, experimenting with new forms of expression. 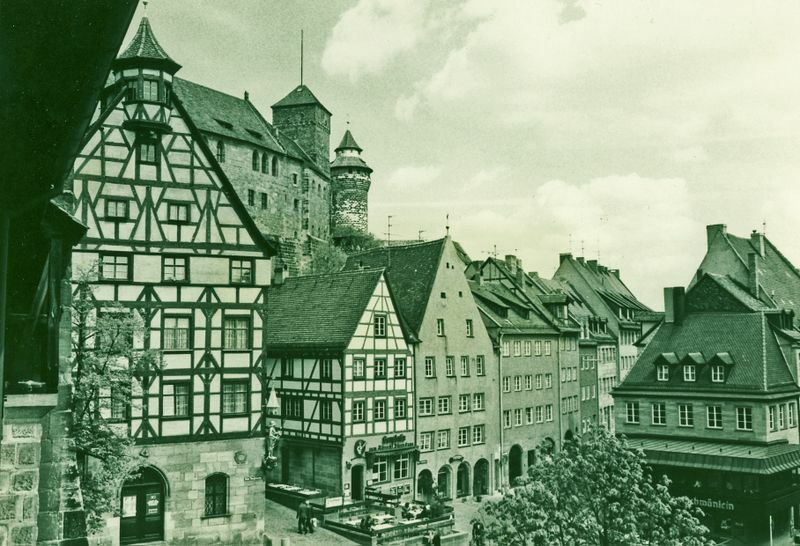 Growing up in Leipzig, Schumann was uncommonly literary. John Daverio , the most intuitive of Schumann scholars, felt that text was integral to the music far more deeply than in the sense of word-painting. Schumann liked the shape of syntax, the rhythms of declamation. Schumann's music drama is "difficult" if we expect it to evolve like Meyerbeer, or even Wagner, with conventional narrative. Instead, it's closer to abstract, conceptual art. Das Paradies und die Peri is pretty much established now, and Genoveva received a major performance in Paris last year (Please read my 2 posts on Genoveva HERE and HERE) Perhaps it's time for a revival of the full Manfred. Petrenko and the RLPO were even better in Tchaikovsky's Manfred Symphony, which was so good I'm staying up to hear it again on rebroadcast later tonight. Extremely vivid, dramatic, intense. The manic extremes don't endear this symphony to those who think of Tchaik as Nutcracker, but for cussed, curséd souls like me, it's thrilling. A rollercoaster ride emotionally, without the danger of having to "live" such extremes. 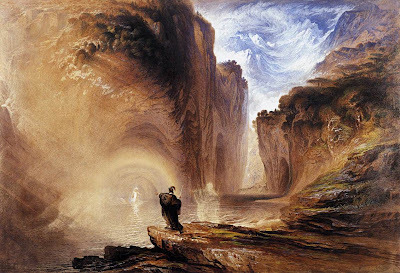 The two paintings are by John Martin, an English Academician, who lived at the same time as Schumann. Note the swirling, circular thrusts of the lines, reality dissolving into abstraction. T he first is where Manfred ascends the Jungfrau and teeters on a precipice, terrifying the chamois hunting peasant. Look how the mountains curve inwards, unnaturally, and blend with the clouds. Lakes as deep and psychedelic as that? In between the two Manfreds, Simon Trpčeski played Rachmaninov Piano Concerto No 2. Wonderful, free playing. "I get the feeling, it doesn't matter the exact notes in live performance," he says.. This man's a true musician. Pity about other commentary, though. The BBC needs to dumb down a bit to reach mass audiences, but to assume we can't relate to Rachmaninov without thinking of movie theme tunes is plain stupid. Maybe for some, but we're not all morons. Please see the beautifully written review by Richard Landau HERE. Those who regularly read this site will know how much I care about young singers. Making a career as a singer is incredibly difficult. Talent is only one factor: even extremely good singers need lucky breaks to make an impact. Not everyone good gets credit (and sometimes those who get credit aren't the best). So a singer must be truly dedicated. It's a vocation, not a job. Proms 2 Die Meistersinger von Nürnberg brought two outstanding young singers to the fore: Andrew Tortise (David) and David Stout. (the Night Watchman). Listen to the broadcast, online on demand until Saturday, and read HERE. There 's more to writing about music than marking tick boxes. Remember, Beckmesser is a fool! Obviously in performance, you have to consider the whole, but it's good to think about singers as people. Andrew Tortise (Trinity 2002) is young but very experienced. He sings Squeak on the LSO recording of Billy Budd (conducted by Daniel Harding). Hearing it live, I was impressed by how well he characterized the role, acting with his voice and body language even though it was a concert performance. He's also sung Novice for Nederlandse Opera. Who knows, one day he might sing Captain Vere. Tortise is interesting because he's got strong character singing skills. Impressive repertoire, too. Read more about him on his agent's website. All eyes were on on Terfel, but sharp ears on David Soar, standing up with the choir, singing Der Nachtwächter. 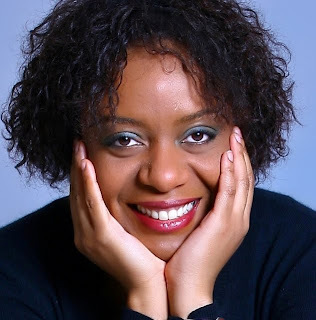 Exceptionally beautiful voice, magisterial timbre and rich with feeling - Sensucht perhaps? For the Night Watchman isn't just the man who sends the townsfolk to bed but the guardian of their souls at night. Long ago I was lucky to meet a baritone who sang the Night Watchman at Bayreuth. He told me how the part works as a borderline between consciousness and instinct. The Meistersingers represent the superego, the"riot" in the town, wilder forces of nature. Ostensibly, the Night Watchman is calling the town to order, but it doesn't mean he will be obeyed. 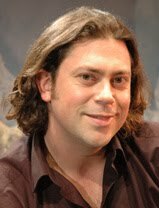 Read more about David Soar HERE (Askonas Holt) Soar studied organ and singing at RAM and had extensive experience in choral singing as well as in other genres before joining the Welsh National Opera chorus and National Opera Scheme. 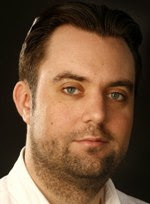 At WNO, he's taken on many roles, including Escamillo, Ferrando and Sparafucile. In August 2010 he's singing Le Duc in Romeo and Juliette at the Salzburg Festival. I'd had an inkling I'd heard that voice, but couldn't place it. Now I remember ! He was one of the Workmen in Wozzeck (Salonen) at the South Bank in October 2009 ! The rest of the cast, including Keenlyside, were immaculately garbed, and sang in the same elegant manner - Soar and Leigh Melrose stood out because they were in grubby overalls, scrapping and singing in true character. 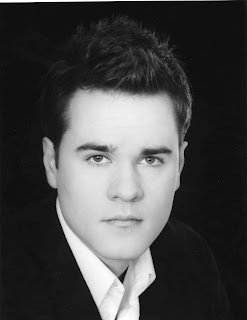 David Stout (also a bass/baritone) was just a name to me before he sang Nachtigall. He sang at the Oxford Lieder Festival a few years back. The OLF is immensely important. It's made a huge difference to song in this country. I'm proud to support it, because it's a noble cause, and extremely well managed. Read more about David Stout HERE. Watch out for him as Manz in A Village Romeo and Juliet for ROH, Papageno, Falke and Ping at WNO. Please also see a piece on the wonderful Royal Opera House Jette Parker Young Artists Scheme HERE. Anything Bryn Terfel appears in will elicit ecstatic praise because he's a national hero. He's iconic: you don't have to be Welsh or British to adore him. His sheer presence makes Prom 2 unmissable, even if you don't know Wagner. A good introduction to the composer and his music. Terfel was, of course, magnificent. Hans Sachs is an ideal vehicle for his talents so it's a surprise that this is his first time in the role. Terfel's forceful timbre suits the "public" Hans Sachs, revered Meistersinger and shaper of public opinion. The Meistersingers represent civic pride and power : Wagnerian singing is often cursed by "park and bark". Fortunately Terfel realizes that there's a lot more to Sachs than public persona. Sachs is a poet after all, and a shoemaker - solitary professions, unlike Town Clerks. Notice how Wagner keeps Sachs in relative reserve until Act One Scene Three. Terfel's finest moments thus came in moments where Sachs is on his own, in his workshop, relating to others one to one. Was duftet doch der Flieder let Terfel sing quietly. Declamation isn't Sachs's style. Terfel's Wahn! Wahn! Überall Wahn! could have had more world-weary pathos, and more delicacy on words like Der Flieder. The Elder tree after all, is critical to the whole opera, for it means new growth, just as Walther von Stoltzing brings new ideas to the Meistersingers. Johannesnacht is Hans Sachs's name-day, to men of his time a potent symbol. But perhaps I quibble, because the Proms reaches mass audiences, not necessarily specialists. Better that Terfel inspires audiences to listen more and discover Wagner in their own time. Terfel looks the part, physically overwhelming Christopher Purves's Beckmesser. Terfel's a big man, but he's nimble on his feet when he has to be, dancing a merry jig around Purves. What a good idea to incorporate this detail from the full staging into concert performance! It's invigorating. Sachs may be old, but he's lively. That's why he sees Walther's potential. This Beckmesser, though, easily stands muster against Terfel's Sachs. Christopher Purves has a real gift for characater singing. He moves about in quick, tense gestures, which amplify the acid-brightness of his singing. Beckmesser isn't an outsider, he's a Meistersinger and Town Clerk, an "insider" if there ever was one, obsessed with rules and status and keeping newcomers out. Purves's Beckmesser is a fool, but too cheerful to be evil. His "songs" are done as are amusing parody rather than grotesque. The harpist who really plays the tune of the lute make it sound quite beautiful in a quirky way. There's also a lot more to Die Meistersinger von Nürnberg than the nationalistic overtones shamelessly hijacked by the Third Reich. So much for their "respect" for Wagner. Die heil'gen Deutsche Kunst meant something completely different to Hans Sachs, living as he did during the Reformation, when Germany was being torn apart in the struggle between Lutheran (German) and Catholic (Foreign) values. That's why Sachs was interested in German identity. Wagner was doing a Luther, too, trying to develop a new kind of music theatre, based on German tradition, as opposed to French and Italian opera. Germany didn't exist as nation-state until 1871 - several years after Meistersinger was written. It was a concept with many positive aspects, supported by many for its modernizing potential. This makes the rise of the Third Reich even more troubling, for it is a paradigm of society..
Prom 2 Meistersinger from WNO reflected Sachs's concept of Germania, not Hitler's. 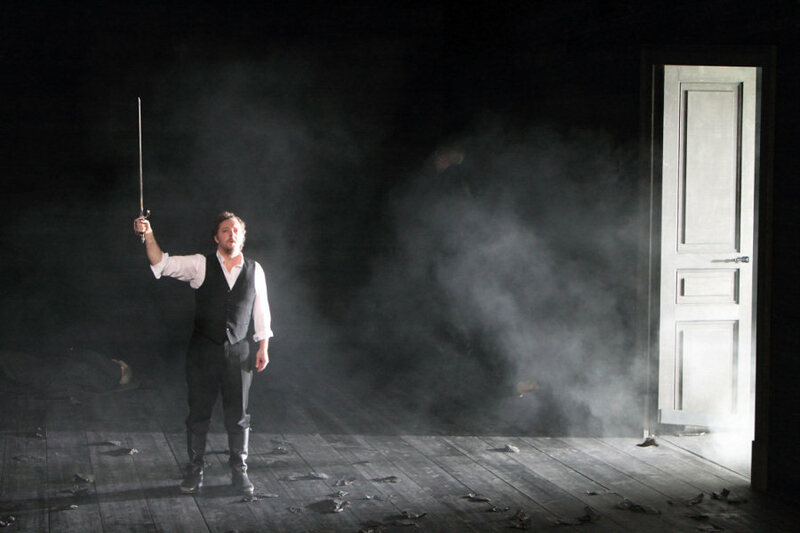 In the WNO production, images of German cultural heroes through the ages are projected onto the stage, reminding us that "holy German art" goes back a thousand years and has produced men like Bach and Goethe. And Art is holy because of what it is, ultimately greater than nations. Walther von Stoltzing is the real outsider in Nuremberg, having learned singing from nature, from birds in the woods (though he read Vogelweide, showing he, too, knows tradition).. He's an aristocrat but significantly declassé, a wanderer like Wagner himself. Because Germany was fragmented until very recently, Germany was full of wanderers, especially after the Thirty Years and Napoleanic wars. Wanderers recur throughout the Romantic genre. Stolzing symbolizes the new. Raymond Very's Walther is good, though not transcendantly luminous. The Prize Song is ravishingly beautiful, but Wagner shows how it develops through experience. Walther's first effort isn't great, but he meets Eva,. His art is created through love. When Very sings the words. Eva, im Paradies his voice expands warmly, expressively. Amanda Roocroft's voice has mellowed and rounded out well. Even if she isn't an ingénue, her Eva is very well realized. This must be one of the crowning moments in her career, immeasurably better than when I last heard her sing Eva about ten years ago. She was spirited, her voice agile and bright. Die Pognerin is too big a role for a babe, which makes casting tricky. Roocroft convinces through her voice. Arguably, Eva doesn't have to be a teen. Magdelena (Anna Burford) is older than David, but she appreciates Walther before he does. The real discovery in this production is Andrew Tortise's David. He's wonderful. Tortise's huge Act One Scene one arias are a tour de force, but Tortise sustains the inner logic through the different stages, pacing himself carefully. On top of this, he acts well, too, a fresher, more impudent Walther in the making. It's an intelligent characterization, because under the comic surface of the role, David is a powerful figure. Wagner doesn't write so much for the role for nothing. Like Walther, David is part of the future. Tortise has impressed me several times before in minor parts. Now, with this superb David, Tortise is the future, too. Brindley Sherratt's Pogner is authoritative as befits someone of his experience and stage personality. Pogner is a more troubling figure than most productions express, because Sherratt makes him sound so firm. Why is he giving his daughter away, against her will, ostensibly for the sake of art? Can people be traded for abstract ideas? Therein lies the dark secret of this opera. If art must be controlled through guilds and conformist rules, is it art? Are rules a means of suppression, or bulwarks against dissolution. Implicitly, in the background lurks the idea of a world in constant transition, where standing still means falling back. Perhaps this is why Meistersinger attracts the Far Right, though there's a lot in it to appeal to the Far Left as well. This set of Meistersingers sang pleasantly, but only Sherratt's Pogner hinted at more unpleasant levels. The Chorus and Orchestra of Welsh National Orchestra, conducted by Lothar Koenigs, supported the performance solidly. Any performance at the Proms generates its own excitement, which creates an aura of wonder that's hard to resist. I had a good time, though on purely musical terms this Prom wasn't a match for the great Meistersingers of the past, though it will be fondly remembered by English-speaking audiences..Nonetheless, the Proms aren't about perfection. They're there to get people stimulated, so they have a good time and go on to hear more. Could there be a more spectacular First Night of the Proms 2010 than Mahler's 8th Symphony? Mahler doesn't mess about.The very first bars explode. It's the mighty Royal Albert Hall Willis organ with its 9997 pipes and 120 stops. No other concert hall comes close: The Royal Albert Hall was made for moments of mega-theatre like this. Mahler's Eighth Symphony is Big Bang, a moment of cosmic illumination that shocks and awes. The energy, in Mahler's case, comes from the invigorating power of love and creative art, so overwhelming that it blitzes all trivia. Artistically, by far the finest Mahler Symphony no 8 I ever heard was in the Philharmonie in Berlin. Read about it HERE Utterly brilliant musical experience. The BBC Symphony Orchestra aren't remotely near that mega-league, but this Prom worked well simply because it was The First Night of the Proms, the beginning of a brand new season. What a sense of occasion! What excitement! This performance was audience participation in the best sense, thousands of people listening intently, willing themselves to be caught up in the moment. It's not "just" music, but the hope of creative rejuvenation. That's WHY "Veni veni Creator Spiritus". When Jiří Bělohlávek was first hired as the BBC's top conductor, many were surprised because he didn't have a high profile like many starrier conductors. But he had a formidable reputation for Czech repertoire. Indeed, he's transformed the whole way the genre is heard, for his style is so fresh and distinctive. But he doesn't milk publicity and play to the media. Because he's unassuming, many don't realize just how much he's achieved. Other conductors may get more fuss made of them, but Bělohlávek is exceptionally good. Oddly enough, he's never quite had the measure of Mahler, so I didn't know what to expect. But Bělohlávek surpassed himself. 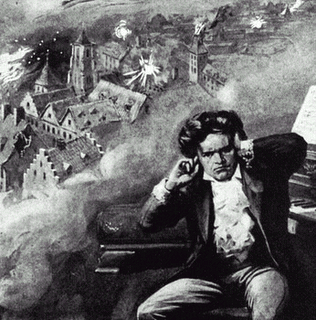 His secret wasn't to listen for the Czech in Mahler, but to Mahler's shocking, apocalyptic message. Just keeping orchestral and choral forces like this together is an achievement for any conductor, but Bělohlávek has them all on message.. No missed entries, no loosening of tempi, but everything hurtling forward as it should. There were sour moments from some sections of the orchestra, and some disappointing singing among the soloists, but Mahler's 8th is greater than the sum of its parts, and Bělohlávek knows it. This was music as theatre, in the perfect setting. Last time I heard Mahler 8 at the Royal Albert Hall (Daniele Gatti) . I was sitting second tier up, in the middle, but right at the opposite end, an ideal spot for this symphony where you need to hear the "whole impact" not just the elements. This time I was up in the circle, excellent for hearing the choruses. It was interesting because you could hear the slightly different styles you get when you have 6 different choirs. One was less polished than the others and tended to drift, but Bělohlávek reined them in gently. The message of this symphony is, after all, that no-one needs to be perfect if they love. Bělohlávek didn't define the individual developments in the piece specially cleanly, but found a lyrical ambiance that worked fine: every conductor, every listener has a different point of view. Because this is Mahler anniversary year, there are a lot of performances coming up (including the Proms), which will be truly grotesque. Bělohlávek isn't ideal but he's infinitely better than many. Be grateful, for what is to come will be much worse. This Prom will probably be the highlight of the entire year, be cause it accessed the drama inherent in the music, without distorting from its tenderness. Bělohlávek understood the slow movement at the beginning of the Second Part. This section is like what Catholics call "Limbo" a state between life and death, before judgement. So, cymbals brushed together so quietly that they sounded like dry, hollow echoes,. If sometimes. the brass sounded a mite sour, in this context, it wasn't wrong. From where I was sitting, most, but not all, of the singers didn't impress. Perhaps when I listen to the recording (available on demand for 7 days) things may sound better. But another curious paradox of Mahler 8 is that the voices aren't all that important. They're just instruments among many others, they are not singing "roles" as you'd expect in an opera. They're more like raised bas-relief than separate statues, to use sculpture terms.Often people coming new to Mahler think he's "operatic" but the deeper they go into the music, the sooner they discard the idea. Whole chapters could be written about why Mahler didn't write operas, too much to write now. But look at the section in Henry-Louis de La Grange's Vol 4 biography for starters. Oh, and ignore that "Symphony of a Thousand" tag. It wasn't Mahler's idea but dreamed up by a publicist. Listen carefully, and the symphony reveals itself as the spiritual journey of one man, and the muse who makes his life worth living. For Mahler, fundamentally, it's not at all "a symphony of a thousand". This Prom was also televised - watch and listen now, for 7 days. This was such a great First Night of the Proms it will probably be repeated, but don't miss out. Please keep reading this site if you like commentary that's processed by a human mind. No generic bland, no recycled programme notes here! Mahler is perhaps my main man, please see other posts. Mahler at the BBC Proms this year won't be that remarkable: Bělohlávek Mahler 8 is the keynote and probably will remain the highlight. That silly season again - BBC Proms ! It's that silly season again - the BBC Proms 2010 start Friday. A whole summer ahead, 90 or so concerts, live, online and broadcast all over the world. Easily the hugest, massivest music festival in the world. The world's Biggest Block Party, where everyone can join in, all over the world, as long as they have net and radio connections. Which means some guy in Outer Mongolia, Tuvalu or Peoria will be able to join in, courtesy of the British taxpayer. This is a much better use of public money than bombs, threats and guns. Cheaper and longer lasting than the Ministry of Defence. One of the most worrying things about the future of classical music is the way it's becoming insular, dominated by anglophone media. It doesn't reflect what's really happening in the world. Although the Proms are presented in English, they help break the anglophone stranglehold. The music is universal. Which is why the BBC Proms are NOT like any other music festival. No pretentious tossers here, pretending to follow with a score. Following Ferneyhough might make sense, but those clever types are usually following something like Carmen, looking for things to object to. While the rest of us are having fun paying attention to the music. Not that the BBC Proms are Beckmesser-free. For some people the whole point is to get off on misery, but let's not waste time on them. Another revered Proms tradition is finding fault. Usual ritual rants: not enough women composers, too much "new" music like that dangerous Stravinsky. My beef is embarrassingly incompetent presenters. Of course the Proms aren't perfect. But think of the sheer logistics of organizing a series like this, which features many of the biggest names in the business, and orchestras from all round the world. Impossible to get everything right all the time. The fun of the Proms is that it stumbles on regardless and somehow pleases most of the people most of the time, which is more than can be said for many things. Silly season - but it's good because people relax and let their hair down. Or up, if you're a woman and it's hot. Because it gets very hot indeed in that Victorian dome. Plus 6000 people emanating body heat. Just be glad that we're not Victorians. Nowadays people shower, wear loose (washed) clothes and use deodorants. Victorians didn't. And if it's not baking, it's storm conditions. Which are OK, except when the queue snakes round the block for hours beforehand. This weekend, with three blockbusters in a row, those queues are going to happen. Which connects to another Proms custom, the Bivouac. If we're going to camp out, we'll do it in style, complete with fold up chairs, parasols, picnic baskets big enough to feed thousands! OTOH, the food is atrocious and over priced. Admittedly you can't make money with summer only restaurants, but all others in the vicinity are poor. And don't forget the fold up bikes, and near Last Night, the flags, banners and silly hats. Some of my friends wear DJs and evening gowns, but that's part of the fun, too, sort of ironic, post modern. Irreverence is a good thing! The Proms brings out an aspect of Englishness that is hard to describe. In the US it's known as Nerd. But affectionate nerd, for the most part. Although there are lots of silly "rules" like chanting, sitting in sacred spots, status issues, and death threats if you jump a queue, etc. there's also a noble purpose. 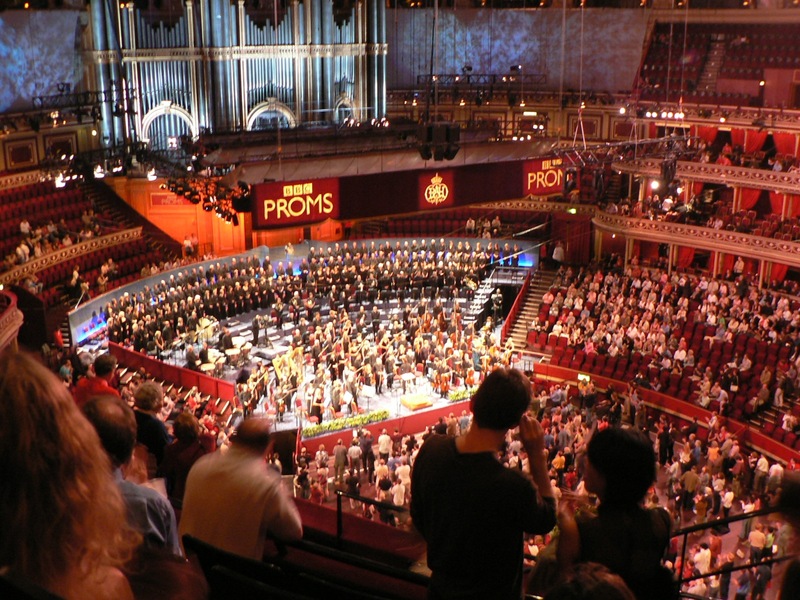 The Proms raise huge funds for musical charities. It's not just for show. When you pop money into those buckets, it's appreciated. Dedicated counters stay up for hours, checking all is above board and the money goes where it's due. It's a serious business that deserves respect. Yet how many Proms traditions are really as ancient as we think they are? That's one of the reasons why they're doing a recreation of a 1910 Prom, so we can experience the difference. Things don't always stay the same. We might even, one day, be able to live with the Last Night exported to Wembley Stadium, its natural home. 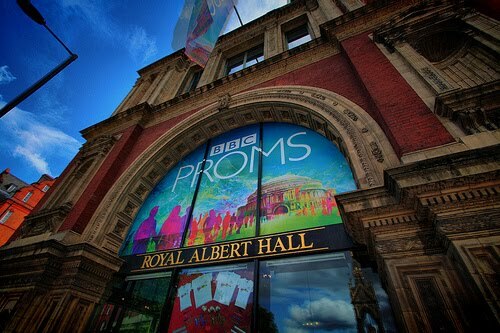 Please see my pieces on the Proms in July, and August and September. I'll be writing lots, but not slavish churning out. I usually do about 40, only ones I can say something original about. I have a life beyond the Proms! Please come back, subscribe, bookmark. And always, HAVE FUN! Roderick Williams sings George Butterworth. This new recording , English Song Series 20: Songs From a Shropshire Lad, is the finest ever. It's a landmark, even by his high standards. It's no secret that I've adored Williams for years, not all that long after he was still appearing with a map of Africa shaved into his hair. Now he's easily the most important exponent of English Song. Hyperbole, perhaps, but Williams really is special, and one of the greatest specialists in English music. (hear him at 3 choirs). English song has suffered from extra-musical affectation, smothered by "cowpat". Hence fake bucolic pretentiousness, fey preciousness, ghettoizing the genre. But the best of English song is so good it doesn't need stylistic coating. Roderick Williams's approach is direct, unfussy, revealing the true artistic merits of what he sings. George Butterworth is one of my great passions, (please see other posts on this site including THIS.) . I've heard many performances, but this new CD includes the finest version of Songs From a Shropshire Lad I have ever heard. Listen to the clarity. and vividness. It feels like you're in a one to one conversation. Because Williams's style is unmannered, there are no barriers, it's personal. And what a voice - naturally warm, very secure in the middle register which Butterworth favours. "A jonquil not a Grecian lad". Often the third song in Butterworth's cycle is overshadowed by more popular songs like The Lads in Their Hundreds, but Williams understand that it isn't necessarily the big, "public" moments that make the cycle, but the elusive intimacy. Look not in my Eyes refers to Narcissus who was so beautiful everyone lusted for him. But his purity was preserved when the Gods turned him into a delicate flower. Butterworth sets the poem with curving sensuousness, but it's the purity that really counts. Williams emphasizes the word "jonquil" simply by respecting the microseconds of silence that set the word apart from the rest of the sentence, colouring the word itself with a reverent sense of wonder. An amazing moment. Grecian lads die or are corrupted, but flowers bloom again each Spring. 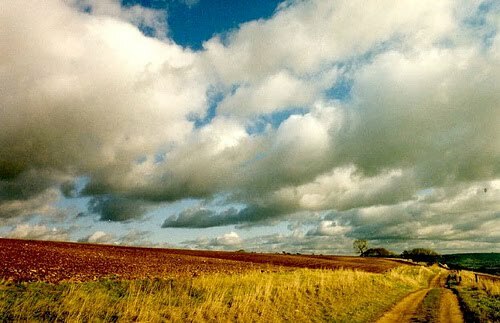 AE Housman didn't actually spend much time in Shropshire, and Butterworth was a terse, repressed Londoner for whom the idea of unspoiled nature meant more than reality. Don't be seduced by verdant trappings. These songs are about a lot more than the countryside. Roderick Williams and his pianist Ian Burnside access the deeper levels in these songs, revealing their true beauty. Williams doesn't make the opening arc in Loveliest of Trees dominate, but shows how the arc repeats throughout: "wearing white...for Eastertide". Purity is of the essence. Too much heat makes blossoms wilt before their time. Williams breathes gently into words, just enough warmth to bring out their fragrance. The flowers are beautiful, but they're also a metaphor for the passing of time, which hangs over the whole cycle. The lads in their hundreds are partying, but soon will die, as Butterworth did, aged only 30, in battle. The dead farmer talks to his friend who has already taken up with the dead man's girlfriend. When I was one and twenty is a play on youth and age. The poet talks like he's old, but only a year has gone by. Time hangs heavily too on Butterworth's Bredon Hill and Other Songs from a Shropshire Lad. Butterworth's setting seems more straightforward than Ralph Vaughan Williams's, but Butterworth's exists only as piano song, without the extra instrumentation that makes RVW's versions soar. RVW created his cycle after his musical breakthrough, working with Ravel. Butterworth, thirteen years younger, never had the chance. Williams and Burnside make a case for Butterworth's cycle. Listen to When the Lad for Longing sighs. Butterworth's minor key is so eerie that it wavers almost towards the pentatonic. Then, On the Idle Hill of Summer, the main phrase curving up and down. The song operates on several levels. Languid summer on the surface, but undercut by images of war and death. "East and west on fields forgotten, bleach the bones of comrades slain". It's not a dreamy day in the Cotswolds. Williams shapes the odd, unsettling phrase archly, so the curves are almost sinister. Butterworth was fascinated by the potential in this piece, creating the orchestral miniature that's so well known. He didn't know that he'd end up dead on the Somme, but we do. Williams sing with poignant dignity. More rarities - the second recording of Folk Songs from Sussex and the little known Requiescat. The pioneer recording, by Mark Stone, was made in November 2009. It must have spurred Naxos into action, as Williams's recording was made in January 2010. Stone is good and deserves credit. In any case, Butterworth fans need both recordings, as Stone's includes rare video footage. Besides, Stone's own label is independent and worth supporting (read about another very good recording on the label HERE) Needless to say, Naxos's sleeve notes are useless and misleading, while Stone's are very good indeed. 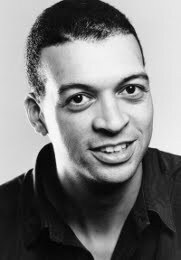 If I praise Roderick Williams, that doesn't diminish Mark Stone, Williams is just unbeatable in this genre, by anyone.. Nonetheless, Roderick Williams is infinitely more experienced, and his insight is unsurpassed. The Sussex Songs are simple, but Williams gives them such character that you wonder why they've remained unrecorded for so long (they've been sitting in the archives for years, and have been published by Stainer and Bell). Folk songs these are but Butterworth isn't "folksy". Williams' s singing is crisp, energetic, direct, matching the jaunty rhythms. Seventeen Come Sunday has complicated nonsense phrases which Williams enunciates nimbly. He even manages to mimic the old Sussex rural accent when it helps colour the songs. The flirtatious girl, who salaciously sings "Roving in the dew makes the milkmaids fair". In Tarry Trousers, Williams sings both mother and daughter! The accents aren't overdone. Williams sings the pompous young man in Yonder stands a lovely creature, then the girl's biting putdown: simple, crisp semi-staccato. These songs came from Sussex, but the people they depict could be anywhere, even today. Unbelievably good sound quality, too - the slight echo in Requiescat may or may not have been deliberate, but it's suitably spooky. Glyndebourne Don Giovanni - amazing !